Can you develop an aeroplane that can fly without a pilot? Interested in an engineering search and rescue solution that could save someone's life? Interested in cutting edge technologies like digital mapping, autopilots and image recognition? Interested in marketing, promotion or management of a large project? Dickson College offers students a very special program called U.A.V. (Unmanned Airborne Vehicle) Outback Challenge that combines a wide range of disciplines into one project. 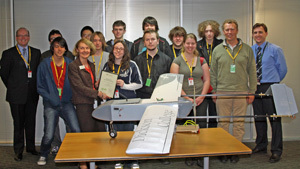 Students involved in this project will be developing an aeroplane and associated computer that will allow an aircraft to search for a stranded person who has become lost in the outback and then deliver a life-saving, rescue package. Students work on various aspects of this very cool project. In October, we will test our skills against other schools from across Australia in the UAV Outback Challenge. This project is open to any year 11 and 12 students from any subject area through I.T., Engineering classes, Clubs & Community and "R" units. Follow this link to the UAV Program Youtube Channel where you will find videos that describe the program and the achievements of our students in a range of projects and competitions.